Dream Wool is made with a Scoured and Super Washed Domestic & Fine Merino Wool that has been blended, carded, cross-lapped & thermally bonded. * The wool is scoured and super-washed for superior cleanliness and to eliminate shrinkage. Quilters Dream's unique processing creates wool batting with exceptionally soft drape, uniformity and strength. 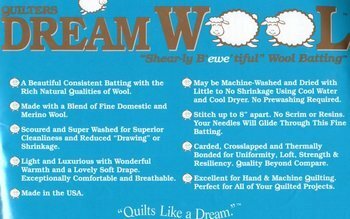 Dream Wool is a beautifully consistent batting that is truly a 'cut above'.